The power supply may be interrupted purposely, such as when you unplug the system. However, disruptions may also occur at the circuit breaker, the fuse, or with the GFCI. These often represent quick and easy fixes. Most garage doors today have a photo sensor that will prevent the door from completely closing if something gets in the line of the laser. If the sensor eye is blocked or if the power supply to the eye is interrupted, then the door won’t operate. Clear the path of the laser and check the power supply. You will probably know right away if the spring is broken; it pops with a loud gunshot noise. 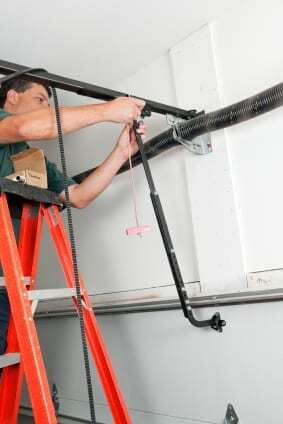 The spring anchor bracket might also cause problems if it gets loose. If either of these issues is the reason that the garage door won’t open, do not use the door or try to make this repair on your own, call the experts instead. There is a sensitivity setting on the garage door opener. If set too high or too low, the sensor will not correctly register the amount of weight on the door. This is a repair that you could easily make by referring to the owner’s manual. There are several issues that can cause your remote control to function incorrectly: the antenna may be broken or a new battery in the remote might do the trick. When your garage door won’t open, you may be able to handle some of the problems, but for the rest, contact Action Garage Door and we will provide the repairs you need. Give us a call at one of our offices: Dallas 972-299-8980, Fort Worth 817-633-3119, Austin 512-213-4905, San Antonio 210-762-5331, and Houston 713-766-3422.